A picture is worth a thousand words or so the old saw goes and it is certainly true that an image can greatly help the look of a blog post. Several people have asked me recently how to add images to blog posts so I thought I’d put up a blog post explaining how I do it in case it would be useful for others. 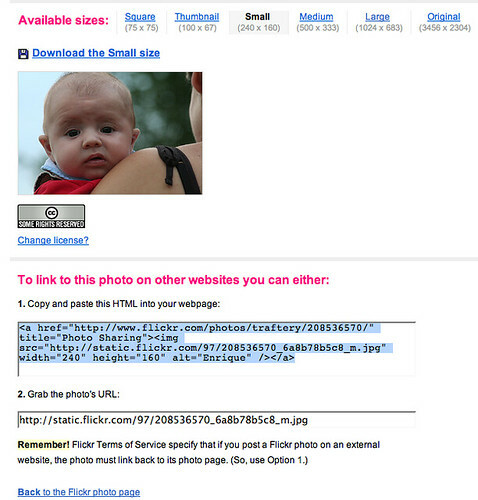 it is easy because Flickr provides the code to use the image from their site! Being a simple soul, I like it when things are made easy for me. Well, click on the image you want to use in your Flickr account. If you don’t have a Flickr account, get one! A free account will allow you to upload 200 images and if you need more than that it costs around $25 p.a. Once you have selected your image, click on the All Sizes button above the picture. This brings you to the Available Sizes screen. Here you decide which image size you want in your blog post and select it. I generally go for images around 500 pixels wide (although the one selected below is 240 pixels wide). Copy and paste that code into your blog post et voilÃ , you now have an image in your blog post.